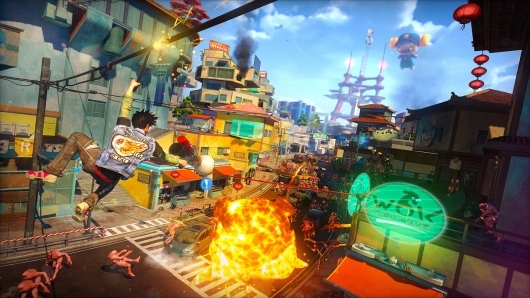 One of the more visually attractive upcoming next-gen (or current-gen, depending on who you ask) titles is Sunset Overdrive, an over-the-top third-person action game bursting with lots of vivid colors. We saw a gameplay video not too long ago, and now a new video with an entertaining cinematic and some gameplay has come out of E3 2014. The game comes from Insomniac Games, the makers of the PlayStation exclusive franchises Spyro the Dragon, Ratchet & Clank, and Resistance, who have jumped to the other team with this new Xbox One exclusive. The game is set in 2027, when a powerful new energy drink has turned consumers into mutants, leaving an employee of the company who released the drink to clean up the mess. You can see the new Sunset Overdrive cinematic and gameplay footage below.